The British Antarctic Oral History Project is the result of collaboration between the UK Antarctic Heritage Trust (UKAHT), British Antarctic Survey (BAS), BAS Club and Scott Polar Research Institute (SPRI). The project’s aim is to capture and preserve the recollections and memories of those extraordinarily dedicated individuals who have worked in Antarctica, with a particular focus on those who worked for, or closely with BAS and its predecessors, Operation Tabarin, 1943-45 and Falkland Islands Dependencies Survey (FIDS), 1945-61. Although the official history of these organisations is well documented by original records held in the BAS Archives Service, this project has provided an opportunity to capture first hand insights into the relationships, culture, decisions and policy that shaped the scientific research in the region at the time. The resulting recordings reveal a fascinating history of life in Antarctica that will be preserved and made accessible for generations to come. The main collection phase, between 2009 and March 2014, prioritised interviews with the older generation. Opportunities for collection were also maximised via reunion events and as diverse a range of experiences as possible were recorded. So far, over 280 interviews have been collected – with service dates ranging from the 1940’s to the present day – all of which are catalogued and held permanently by the BAS Archives Service. 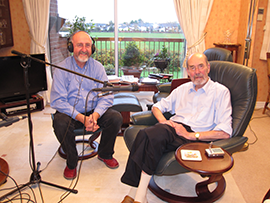 51 interviews and transcripts are currently accessible via the BAS Club website (http://basclub.org/oral-history/). Yorkshire based agency, Digital Nomads worked with the project partners to develop the web based platform, which makes the archive accessible on a range of devices, including mobile. The transcription process continues, and as more interviews become available both the recording and transcription will be added to the BAS Club site. Bringing the project together required a huge, co-ordinated effort on behalf of the organisations involved. In addition to which a fantastic team of dedicated volunteers have also worked tirelessly to bring the project to fruition and whose efforts underpin its success. The UKAHT, BAS, BAS Club and SPRI are extremely grateful to all the interviewees, interviewers, co-ordinators and volunteers for their continued support. Financial assistance for the project was kindly provided by the BAT Government, Capital Group, the South Georgia Association, BAS Club and UKAHT. The United Kingdom Antarctic Heritage Trust (UKAHT) exists to advance the preservation, enhancement and promotion of Antarctic heritage and to engage, inform and inspire a global audience. The UKAHT is a UK based charity dedicated to promoting Antarctic heritage and this is achieved through the care and conservation of historic buildings and artefacts and delivering and supporting a range of innovative programmes. All sale proceeds from the shop enable the UKAHT to continue their conservation and awareness programmes. The Scott Polar Research Institute is part of the University of Cambridge. Founded in 1920 as a national memorial to Captain Scott and the polar party, the Institute has been an international centre for polar science and social science research and for Britain’s polar heritage since then. From rigorous scientific enquiry into the nature of ice and climate change to protecting and displaying Britain’s historic polar heritage, the Scott Polar Research Institute has remained at the vanguard of polar study for nearly a century. Digital Nomads is a niche consultancy specialising in digital innovation and worked closely with the British Antarctic Oral History Project partners to develop the content and platform for the project. Digital Nomads offers a range of services including web design, web hosting and domain name registration. The company also offers training and consultancy to businesses on social media, WordPress and the general application of digital technologies. To find out more visit www.digital-nomads.com. I’d be happy to be interviewed for the collection. Antarctic Cruise Ship “the World” – 6 weeks happening now. I will return to New Zealand end January. Do let me know if I can be of help. Allan Wearden has replied by email I hear. The project isn’t conducting any interviews at the moment, but will take note of interest expressed.